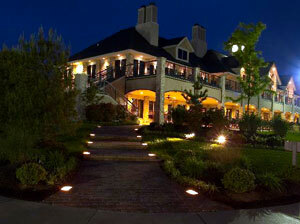 Kerr Lighting holds patents in both US and Canada for the PaverLight and the Deck Light. They are the first fixture of their kind in the world. They have proven themselves to stand up in conditions from the harshest Canadian Winters to sand storms in Oman and the heat of California. Kerr Lights work on any 12-volt system and are very safe and inexpensive to operate. 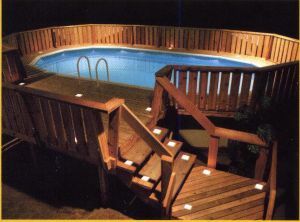 Kerr Lighting systems have been guiding home owners and their guests into their driveways, through pathways and walkways around pools and patios since 1995, enhancing the beauty of their landscape, while deterring theft and adding value to the consumer's property. Choose the style & size of light fixture that will work best for your project. 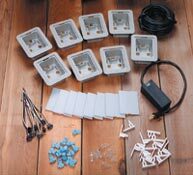 PAVER LIGHTS come in 5 sizes: 4" x 8", 4½" x 7", 4.½" x 9", 6" x 6", & 6" x 9"
RETAINING WALL LIGHTS come in 2 sizes: 4" x 12" & 6" x8"
DECK/DOCK LIGHTS are: 4" x 3" and work with all types of decking materials.